If you’ve taken the plunge and bought your own golf cart rather than renting one to save money, then it’s a good idea to look at buying a trailer to haul it from course to course. Choosing one to fit your particular model golf cart shouldn’t be too hard if you get the size and weight correct. What is the best golf cart trailer for you? Here are a few things to consider before purchasing a trailer, along with the tools to calculate tongue weight and capacity. On a non-custom trailer, the trailer you are choosing will have a safety rating so make sure that the one you’re choosing has the best rating possible. Find a trailer that can use the back hatch as a ramp for your golf cart so you can easily load and unload your golf cart without having to pack any additional ramps. Any of the trailers that are available from places like Home Depot or Lowe’s will be considered utility trailers and not necessarily capable of holding the weight of a golf cart on the expanded metal ramp. In these cases, you may have to supplement with wooden boards to take the weight off of the weld points on the frame. Many of these weld points are too few in number to hold the concentrated weight at the point between tire and trailer. If you have the equipment to do so, you can add spot welds to beef the ramp up a bit. Safety chains and tail light wiring harnesses are a must-have to protect your investment and fellow drivers. Take the time to ensure the signals and brake lights operate properly before heading into traffic. There are some excellent receivers and hitches for sale here. Always check out the manufacturer’s reviews online and compare them to your individual needs. It goes without saying that you could always measure the width and the length of your golf cart and then set out to find the proper trailer, but sometimes the dimensions of the trailers are pre-set and not exactly the size you’re looking for. An ideal size for most golf carts will be 5 feet wide by 10 feet long, but sometimes a non-custom trailer just doesn’t fit your custom golf cart. A good example is a trailer I bought that should have been just perfect but the custom body hangs two feet over the back. 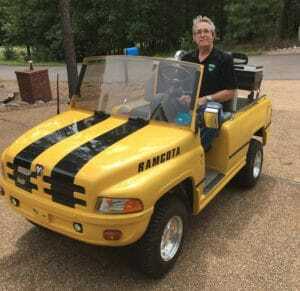 I was assured by the seller that this trailer would fit any two-seater golf cart, and if I had the original club car body, that would have been true. The trailer was a great buy, but it was only 8 feet long. A 10 foot would have been perfect. If you have a small trailer, you may be able to load the golf cart backward letting the rear of the body overhang the front of the trailer. Measure from the ground to the bottom of the rear of the golf cart and compare it to the height of the front of the trailer. If you load the vehicle backward, remove the windshield if possible, then secure or remove the front seat bottom (most of them swing up from the back and might catch the wind). How Do You Find Your Trailer’s Tongue Weight? This widget from Double D Trailers can help calculate the tongue weight by inputting the weight of the trailer, length of the trailer (Note: this is minus the tongue) and the distance from the center of the axle or axles. Trailer Gross Vehicle Weight Rating (GVWR) is the amount of weight the trailer can carry. Some manufacturers rate the GVWR at the lowest component rating, while others include the trailer’s weight on top of the trailer capacity. If you have a trailer that weighs 2,000 pounds, that weight must be included in the capacity formula to stay under the GVWR. Taking the lowest rating of the trailer components. Using the hub and wheel rating. Using the axle or tire rating. All of these methods will determine the GVWR at the axle. In other words, if your axle is rated at 2000 pounds and you have two axles, your GVWR will be 4000 pounds. A golf cart’s weight (Listed as Curb Weight) is important to know when it comes to determining if your trailer is up to the task. The golf cart’s weight is between 630 and 1600 lbs based on the available new models in the top three manufacturers, EZGO, Club Car, and Yamaha. These numbers vary due to passenger capacity, gas or electric, and aluminum or steel frames. Owning a lightweight SUV like my Honda HRV, I was concerned about the towing capacity I have versus the weight of the trailer plus the cart. Obviously, an electric cart is going to have two different weights: with batteries and without. The batteries are 63 to 72 lbs each and you can multiply that times how many your cart takes. Below is a table listing the top three manufacturers published specifications. Safety is often the last thing you consider when loading up to head to another cart adventure, but the hundreds or even thousands of pounds you are pulling behind you at highway speeds can turn into a lethal juggernaut unless time is spent preparing the equipment. Always check the bearing grease when you get the opportunity, as this is the number one cause of trailer failure. Keep those safety chains on, the air pressure topped off in the tires and keep the Highway Patrol happy by not overloading the trailer.